So, I have been debating on whether or not to write a GP book for years, now. The reason I haven't done so yet is that I remember what it's like not to have health insurance and having to choose between the doctor and medications for the month or rent. However, I have put most of the pertinent information online for free, in my blog. I am working on my outline at present, before I start writing. I want to make sure I cover a lot of ground, and I do not want to lose focus on that. I don't believe in profiting off of sick people. If this book does sell well, and that's a shot in the dark, I don't need the money so I could send it to a foundation I trust. That's if it sells well. If it does, maybe I can start a 501(c)3 in Atlanta, and expand across GA to help people to get to doctor's appts, fight with their ins companies for them, help them get assistance or something like that. But, if it went to a great cause, like helping others in the community find rides cheaply or at no cost to them, people who could help with insurance hangups, someone to fight for you with your doctor, I mean, I've got a lot of ideas. Please fill out the form below if you are interested in helping me. I will be glad to give credit where credit is due. I really do appreciate this, because I am so tired of losing friends. We need some help and I'm not saying I'm that person, but I'm going to try my best to write something helpful, and maybe it will be published. I hope if it is, that even if they just sell one, I hope it goes to the doctor/scientist who will do research for us. That's my fantasy. I try to remain optimistic. But, the form is below. Just fill that out and again, thank you. 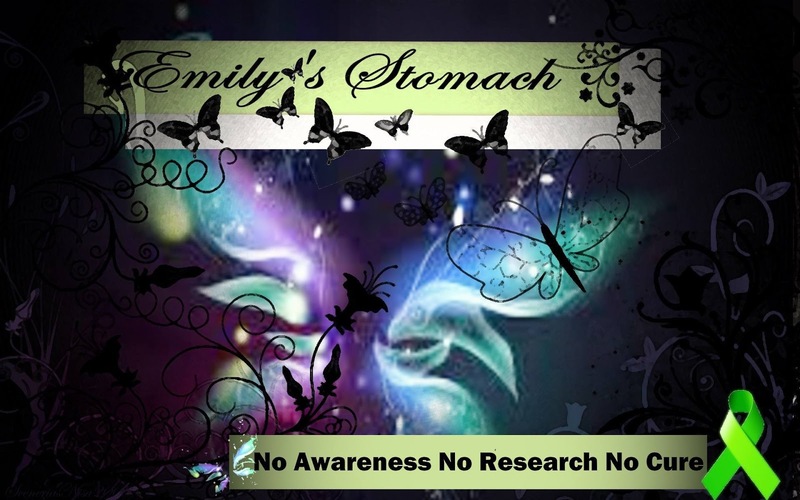 If you would like to contact me about the questions above, what I should include, and/or if you want to send me your personal stories with photos (I already have photos people have sent me of them before and after GP, which you can do too - or I'm working on a project on my page Gastroparesis - Emily's Stomach, "A Day in the Life of a GPer" which is an event that shows GPers without make up, hair done, no airbrushing or anything, just how we look daily with GP, if you want to send a picture like that. It's up to you). I know that this research is NOT scientifically accurate because I do not have access to your medical records or anything, but I still have A LOT of your Progressional Timelines that I wanted to graph and insert into the book. I would like you to email your timelines to me, but please let me know it's OK to for me to use your timeline results in my book, let me know how you want me to use your name, or if you would like me to change your name. I need a valid email address you're mailing it from, just in case I have any follow up questions. Your personal information will be respected because I respect privacy. I'm hoping, that even though my research is thorough, but not scientifically accurate, that someone will read the book who has the power to make this scientifically accurate and start up a research project. I'm sure I may think of other questions and things later, but I REALLY appreciate any help you guys can spare. I'm going to include a very special thank you page to each person who emails me to help me with this. I believe in giving credit where credit is due. You guys are amazing and I really hope once I sit down to write this, that somehow, it will get to the right person who can do research for better treatments for us. It's not enough to survive, we need to LIVE too!